We’ve lost much of the old-timey wisdom of our ancestors which helped them overcome the hardships they encountered living the self-sufficient lifestyle. Cinnamon was a part of the medicine cabinet as well as the spice shelf. My grandmother kept cinnamon and honey mixed together in a bowl. We thought it was simply a biscuit topping or a treat we got to get a spoon of every now and then. Turns out true cinnamon, is a natural food offering an abundance of health benefits which we all need to live a vibrant, naturally healthy, self-sustaining lifestyle. But is it as easy as going to your local grocery store and picking up a jar? Yes and no…. Let me share with you what you need to know before you make your decision. You have to specifically look for what I call real cinnamon. You see there is Ceylon (true cinnamon), which is sweeter and much healthier than what’s sold at the local grocery store which is usually Cassia cinnamon. Cassia is harvested from the bark of evergreen trees including c. cassia and cinnamomum iners in China and Indonesia. Ceylon cinnamon is native to Sri Lanka and is harvested from the bark of a small tree called c. verum. They’re harvested in different ways and although they may seem similar, they’re very different when it comes to your body and its health. Ceylon is harvested twice a year as soon as the rainy seasons are over. First, farmers cut the smaller shoots, cover them and leave them to ferment. Once the Ceylon is fermented, the outer bark is stripped off. Next, the soft inner bark is rubbed and peeled away from the small shoots. Workers stack the bark together in layers. As these layers dry, they roll up together forming cinnamon sticks. Ceylon sticks or quills kind of look like tightly rolled cigars. Ground Ceylon is made from the older, lower portion of the tree since it’s the more flavorful portion of the tree. Cassia Cinnamon is harvested by using branches and even entire trees instead of the small shoots and outer bark as with Ceylon cinnamon. Once the whole branch is removed, the outer bark is peeled away and sold in unprocessed chunks. With the outer bark removed, the inner bark curls up forming a quill. The quill or stick of Cassia looks different than Ceylon so you can easily tell the cinnamon sticks apart. Cassia sticks are darker and thicker than Ceylon and they look like a single sheet of bark curled up. Another quick visual guide is to look at them from the end. Ceylon sticks will be full looking while Cassia sticks will look hollow as you’ll be able to see all the way through them. They are similar in that ground Cassia cinnamon is also made from the lower bark of the tree. Don’t just take my word for it, here is Dr. Axe in a short video telling us why we should be using real cinnamon as part of our daily lives. I hope you stay healthy in our modern world and TFL is here to help you find the information you need. If you already have one of the health issues which real cinnamon has been used to curb from ancient times, I hope this information leads you to a speedy recovery and relief. I wish you a Healthy, Happy, Homestead in the years to come. Here’s a slide share with some of the same information that Dr. Axe covered for those of my friends who have a hard time streaming videos on their computers. If the region your cinnamon grows in is important to you, make sure you purchase cinnamon from distributors who label the type of cinnamon being sold. Not all cinnamons are labeled either Ceylon or Cassia, particularly as the two are not only sold interchangeably, they are also sometimes mixed. Those companies which do label theirs Ceylon or Cassia typically also give the origin of the spice. I order my Ceylon cinnamon from Mountain Rose Herbs and no, I’m not an affiliate. I choose to order from them because of their standards of business, quality of products and their focus on sustainability. 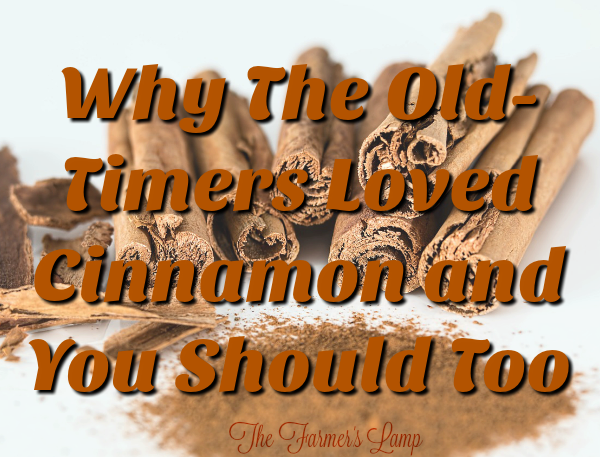 Do you have a favorite way to use cinnamon? We use it daily from oatmeal to sweet potatoes. Share with us in the comments.